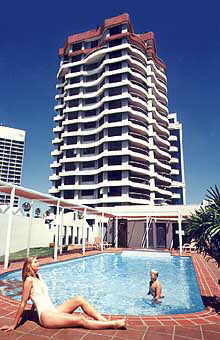 15 Victoria Avenue, Broadbeach, Queensland 4218 Australia. Luxurious holiday apartments and penthouses at Queensland's top holiday destination. The famous Surfers Paradise beaches, world-class golf courses, theme parks, Gold Coast tours, restaurants, casino and nightlife, patrolled surf beaches. Broadbeach adjoins Surfers Paradise and offers holiday makers and visitors the lot! Restaurants, coffee shops, casino, patrolled beach, great shopping.... its all there. And right in the middle is Victoria Square Luxury Holiday Apartments, ideally located in traffic free Broadbeach Mall. Just 100 metres to a patrolled beach, right opposite the fabulous Oasis Shopping Resort, and only a short monorail ride to the famous Jupiters Casino. Holiday condominium and penthouse accommodation that is modern, spacious and very inviting. Great northerly aspects across Surfers Paradise and the Gold Coast from large balconies. bathroom has a full size bath. single beds and separate bathroom. Fax, Photocopying and email facilities. Your Hosts look forward to welcoming you and ensuring you have a great holiday. They can arrange tickets to all theme parks and attractions.